Lots of homes have spaces that aren't big, but still have plenty to offer. So how do we decorate them? Your home's small spaces don't have to go to waste, and you don't have to get a migraine from deciding how to decorate them, either. Whatever you have in mind — a reading nook, a closet office or a guest bathroom (or anything else your heart desires) — use these tips to make the most out of decorating a small space. 1. A cohesive color scheme goes a long way. When you nail a color-coordinated outfit, you know your style game is on point and the same concept applies to decorating a small space. There's something about a color-coordinated room that just really works. The visual effect of a well-thought out color scheme has a big impact on a small space; namely, it makes the space feel larger. When decorating a small space, coordinate floor coverings with with your chosen paint colors, and work accent colors into your decor for a truly cohesive color scheme. 2. Mirrors are your friend. We all have our bad days as well as good, so most of us humans tend to have a love/hate relationship with mirrors, but between mirrors and small spaces, it's nothing but love. Mirrors are the small-space-decorator's ace in the hole, and one of the most effective ways to make a small space feel larger. They're also a great way to brighten a room (which also makes it feel bigger), so feel free to fill your small space with multiple mirrors. And you don't have to break the bank to start your collection - you can pick up each of these decorative mirrors for less than $100. 3. Clear furniture (visually) takes up virtually no space. Using clear furniture to decorate your space is another simple design idea that makes small spaces feel much bigger. We have to be especially careful not to let our inner stylists get overly enthusiastic when decorating a small space, or we can end up with visually cluttered rooms (and you're far too savvy of a decorator to let that happen). 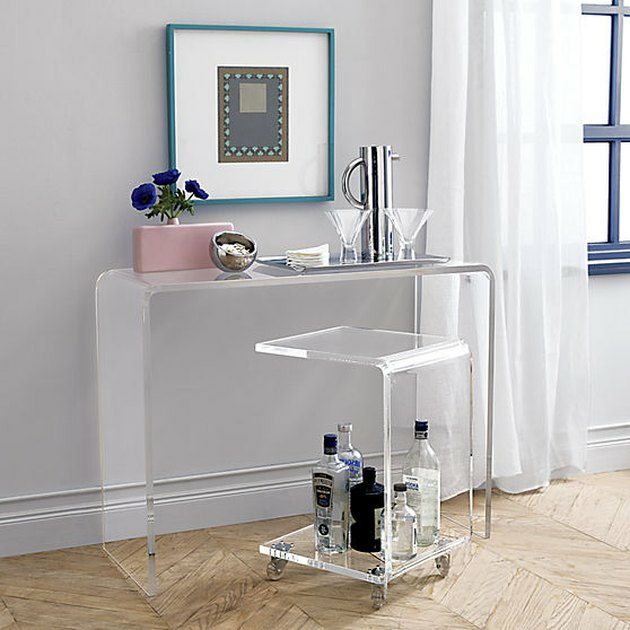 Transparent furniture like the acrylic console table pictured above is practically functional, but visually unimposing ( CB2, $379 ). 4. There are tons of ways to hide storage. This is one of the most innovative storage solutions around, a prototype developed by YO! 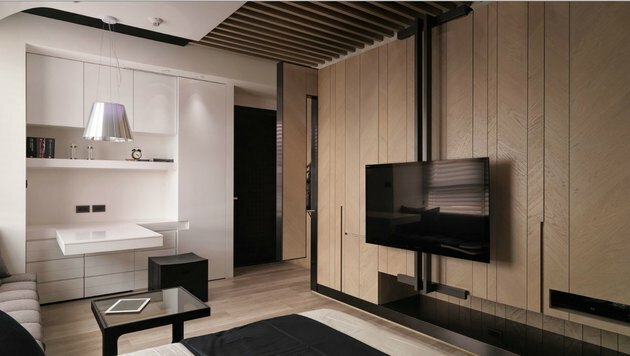 Company, a business dedicated to developing creative designs for small spaces. While this type of hidden storage may be a bit out of reach for the DIY layman, the principle it demonstrates is essential for small space decorators to keep in mind. One of the most common mistakes made when decorating small spaces is overlooking opportunities for hidden storage. 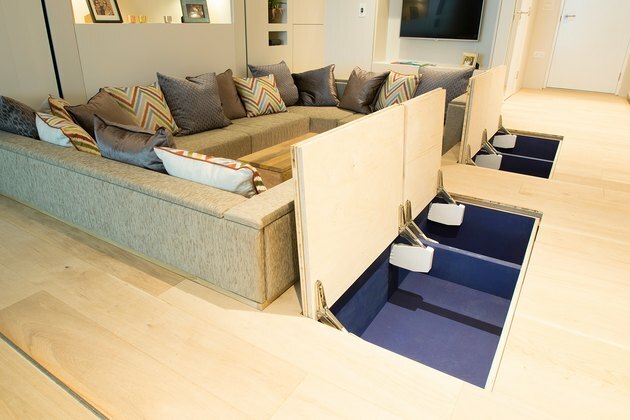 Retailers like Wayfair, Domino, and many more offer products like ottomans, coffee tables, and even beds that feature hidden storage solutions. 5. Ladder shelving is a great space saver. Ladder shelving does double duty in a small space. In addition to giving you multiple surfaces for storage and displays, a ladder shelf draws the eye upward, which creates the appearance of higher ceilings. 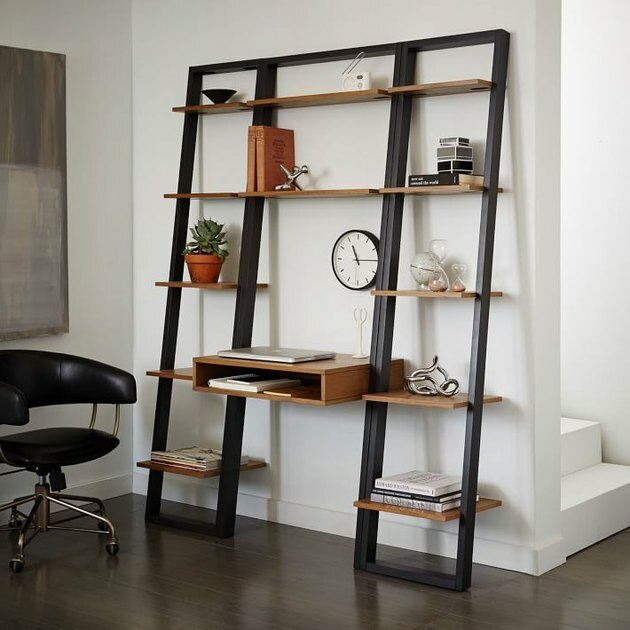 This particular ladder shelving unit from West Elm ( $677 ) is a triple-threat with the addition of a writing desk among the ladder's rungs (and note the extra storage built into the desk). When decorating a small space, multifunctional furniture can take your room to the next level. 6. Pegboards have infinite uses. 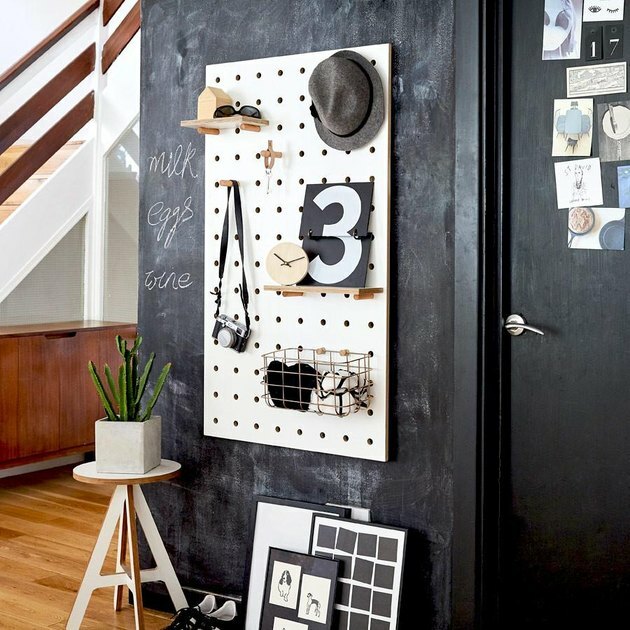 Pegboards are almost uncannily perfect for decorating small spaces. They're totally changeable and customizable, and not to mention space saving thanks to being wall-mounted. They may seem simple, but they're incredibly dynamic: you'd be surprised by all of the ways that pegboards can work in your space. 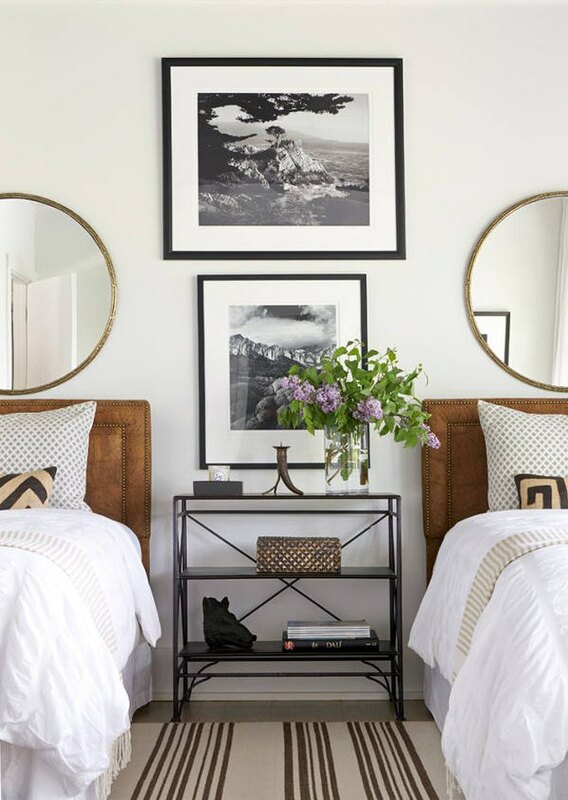 Help your small space reach its fullest potential with the visual symmetry of balanced decor. Not only will the room look bigger (and neater), well-balanced visual surroundings can have a calming effect. Start by sketching the layout of the room, bearing in mind its dimensions (and key measurements). Along with a balanced color scheme, make symmetry a style priority when decorating a small space. 8. Wall space is valuable real estate. In small rooms, the use of wall space is critical. 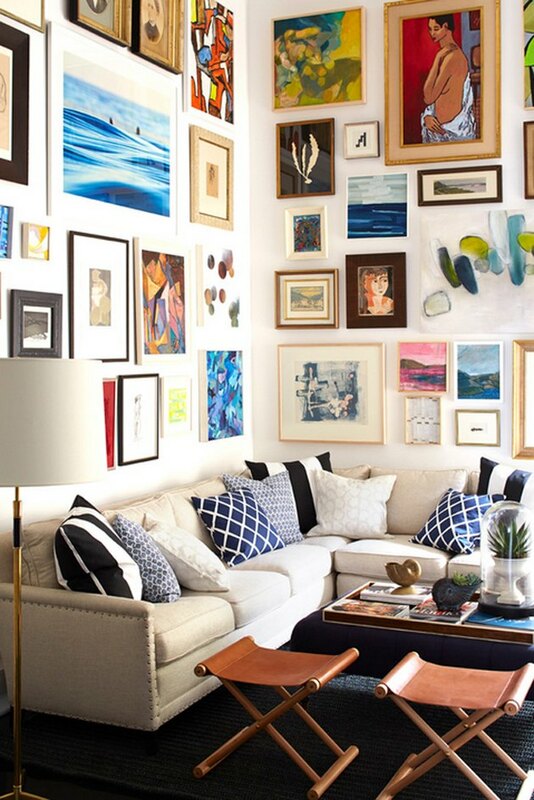 How you choose to decorate your walls will of course depend on the room's intended use, but don't be afraid to go all out and use the whole wall, like the gallery style decor pictured in the living room above. Floating shelves, art prints and photographs, pegboards, light fixtures — they can do it all. Make your walls work for you, especially in decorating small spaces.